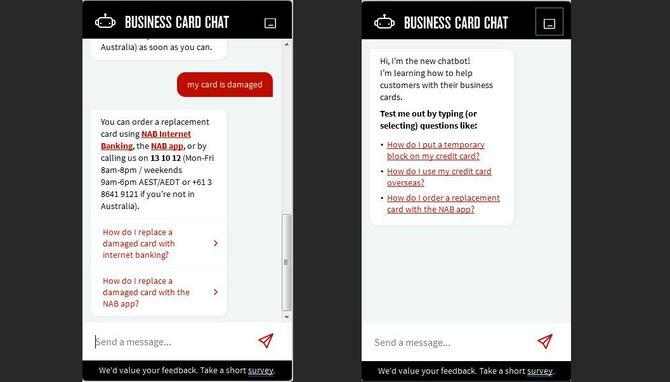 NAB has launched a virtual chatbot aimed at helping business customers better answer common banking queries online. The digital virtual banker pilot is running on the banking giant’s nan.com.au website and has been designed to answer more than 200 common questions relating to business banking accounts, with 13,000 variants. If the artificial intelligence-powered bot can’t answer a question, the inquiry is then reverted to a human banker. The questions and responses were based on thousands of real-life customer enquiries. NAB said customers were also involved in the initial testing and development phases, where 75 per cent agreed a virtual banking assistance would be a desirable offering to have available. The self-service assistant has also been extended to a tutorial video for NAB Connect users aimed at helping customers understand how to better use the platform by doing things like adding users or setting up recurring payments. NAB chief operating officer, Anthony Cahill, said the name of the virtual game was to offer solutions that make life easier for customers. The solution was the brainchild of NAB’s customer journey team and based on a re-imagining of specific customer experiences. “Our research shows that two-thirds of Australian SMEs cite dealing with administrative tasks as taking a lot of effort, and our customers desperately want to spend more time on their business and less time on dealing with admin tasks,” he said. NAB claims to have 1000 employees across different divisions, including marketing, product and banking, working on similarly themed projects. Talking on the launch of the virtual banker, NAB’s EGM of business transformation, Anne Bennett, said customers are doing 275 million things with the banking giant a year, and it’s keen to make as many of them as easy and accessible as possible. According to Forrester’s State of Chatbots report, chatbots have the potential to improve information distribution, customer care, commerce, and marketing over time by making them more natural. A recent survey undertaken by LivePerson also suggested consumers are warming to bots even as they still prefer to interact with a human. According to its report, the majority of Australian consumers have a positive or neutral perception of using a bot to communicate with a brand’s customer service, slightly higher than global averages.